First we need to make curds (caillé) and whey (petit-lait). Curds are harvested by curdling the milk and draining off the liquid portion or whey. 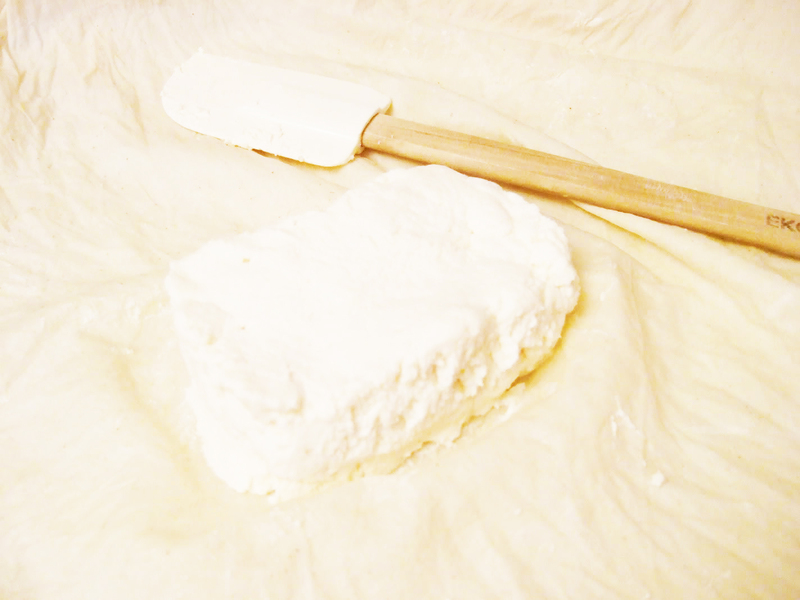 In some regions of England, curds produced from the use of rennet is referred to as junket, with true curds and whey only occurring from the natural separation of milk due to its environment (temperature, acidity). So today we will be using only temperature and natural vinegar. In a large pot bring 12 C milk + 2 tsp of salt to a boil. At the first sign of bubbles add the 5 tsp of vinegar. 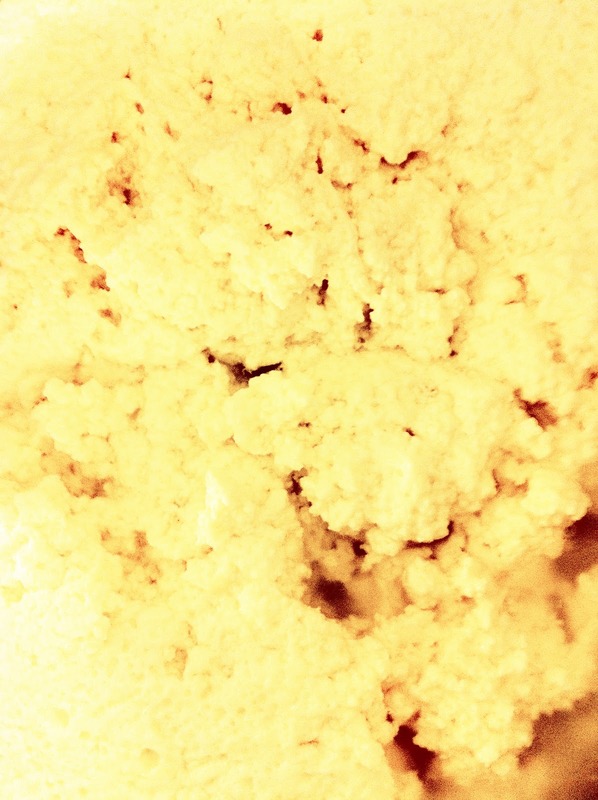 Stir, if the curds separate from the whey, then take it off the heat and don’t touch it for two hours. (If the curds and whey do not immediately appear continue heating and add more vinegar until they begin to separate, then remove from the heat.) Once the separating process has begun, it will continue on it’s own. 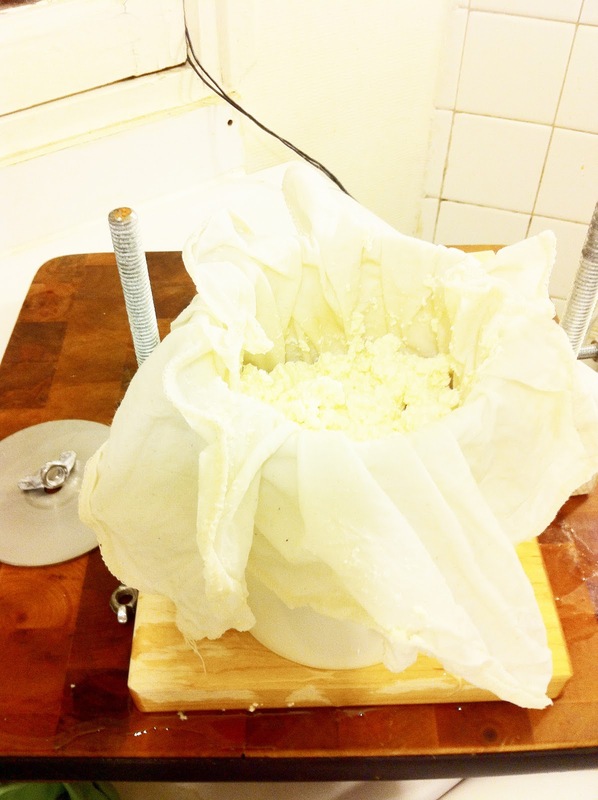 After two hours you’ll need to strain your cheese, catching all the curds and allowing all the whey to drain out. To do this you’ll need a cheesecloth or a fine weave linen tea towel. Line your colander with this cloth and slowly pour the cold curds and whey into the middle of the cloth. 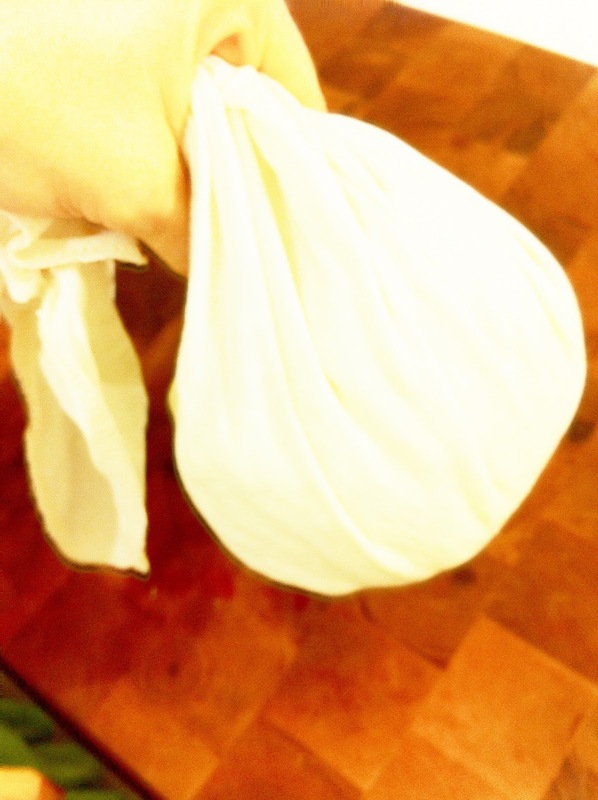 Then when all the curds are piled up on the cloth, pull up each of the four corners and grab them with one fist, grab the bulging towel full of curds on the other end with your other hand and twist. Twist, Twist, Twist. When no more whey is dripping, or if the curds start squirting through your towel, unwrap the cheese into a very large mixing bowl. You should have about 2 lbs (900g) of cheese. I make this fresh cheese so often that my dear husband has purchased me a real cheese press. 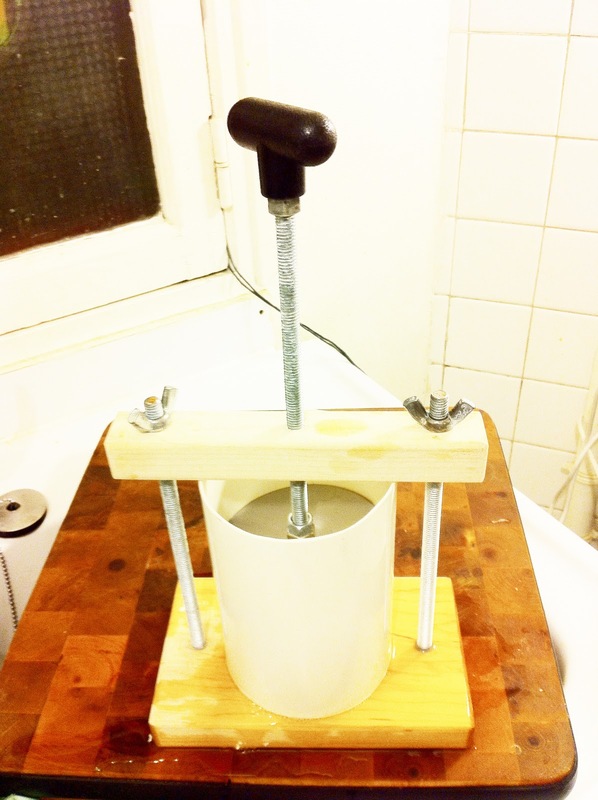 If your hands get tired from twisting and pressing the cheese cloth a cheese press is a great idea. You can even get a similar effect without the fancy kitchen gadget, just place something heavy on your cheese bag so that the weight does all of the work for you. Is the milk in the recipe pasteurized, homogenized? Is it skim, 2% or whole? Great question! And the answer is simple… However you like it best. I use the cheapest I find at the supermarket, for me that’s half-fat HDT cow’s milk. But you can use whole, or whatever. And I don’t see why raw wouldn’t work, since lots of cheeses are made from raw milk, but I’ve never tried because that’s not convenient for me. Readers have told me they’re planning on trying raw milk or goat’s milk but I haven’t heard back. Basically the goal is that it tastes good, so use what you like. 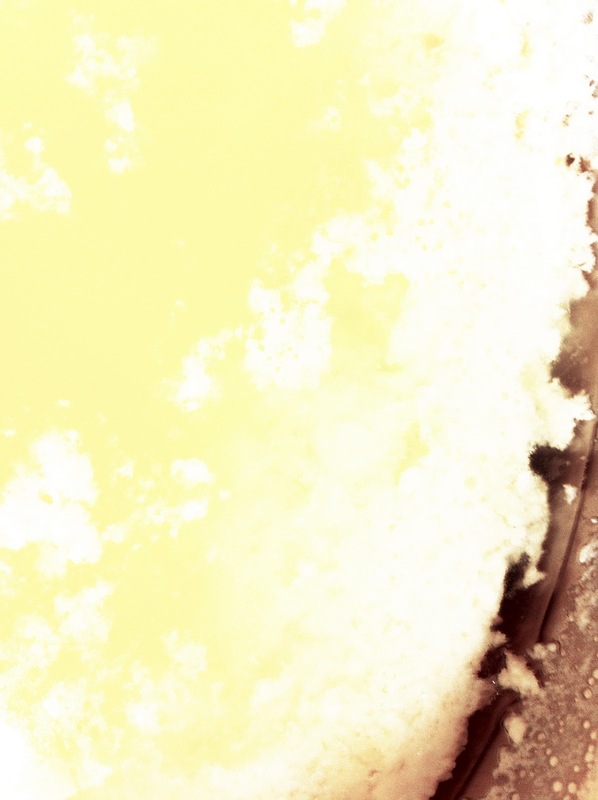 Here’s a tip – Don’t get hung up counting the time or the temp. When the milk begins to rumble add the vinegar slowly, keep the heat on and don’t give up until you actually see the curds separate from the whey.